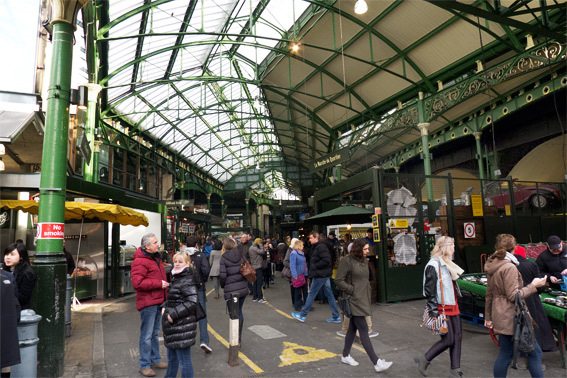 A market is said to have existed on or near the current site of Borough Market since 1014. The current buildings were erected between 1851 and 1860. They have seen a considerable amount of change over the last ten years – next week sees the reopening of Three Crown Square, closed for building work and refurbishment since 2009. 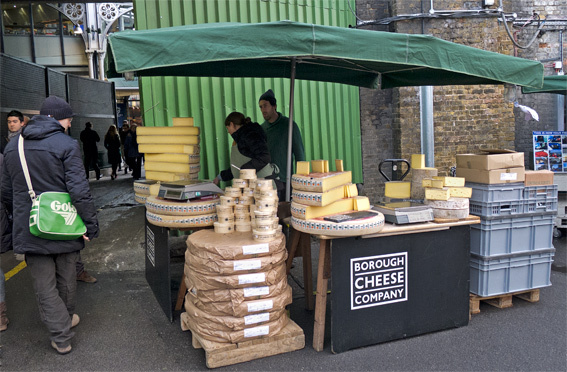 Borough Market acts as a wholesale food market from 2 – 8 am and since the late 90’s on Thursdays, Fridays and Saturdays it houses a retail market selling fine foods to the general public. It can be busy at lunchtimes, when local office workers visit to buy hot food and sandwiches. It’s especially busy on Saturdays, being popular with tourists and those looking to purchase high quality and exotic foods. 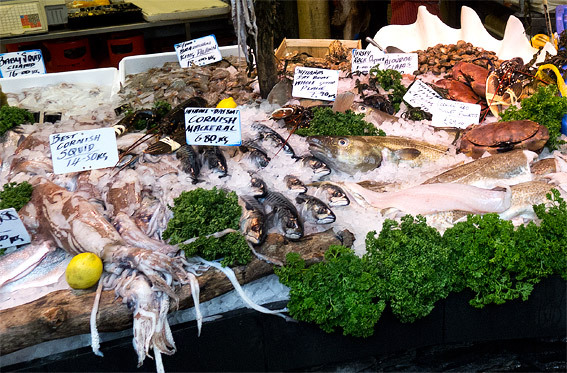 which very few fishmongers in London can equal. 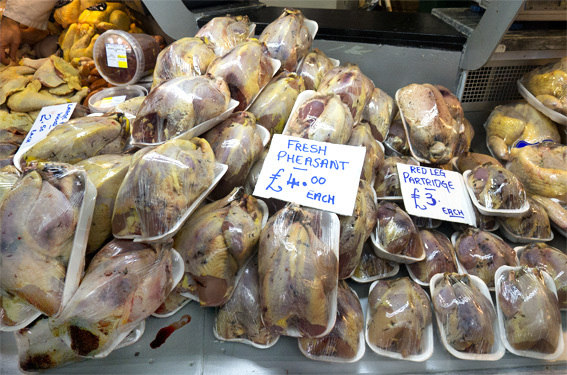 There are still a considerable amount of game birds on sale, but as the season has finished it’s likely to be the last week they are available, until the end of next Autumn. 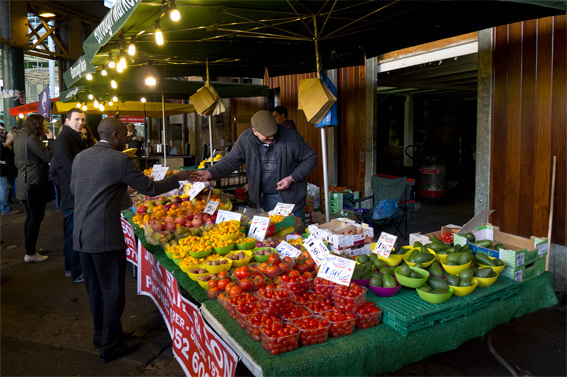 The market is made up of several areas, with railway lines from London Bridge Station crossing above them. 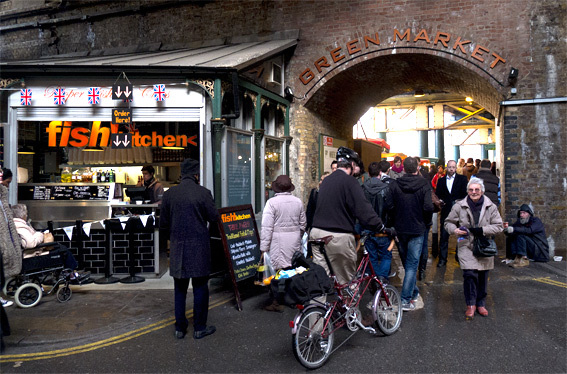 Passing through a Victorian railway arch into the Green Market, next to Southwark Cathedral, it’s sad to see that some things haven’t changed in 150 years – there’s a Dickensian looking old man begging next to the right hand side of the archway. Bread Ahead Bakery stood out from other bakers at the market with their spectacular Le Pain Grand – middle left, which must be nearly 3 feet long! There is, of course, a large selection of vegetables, including pears from Kent and tomatoes from the Isle of White. 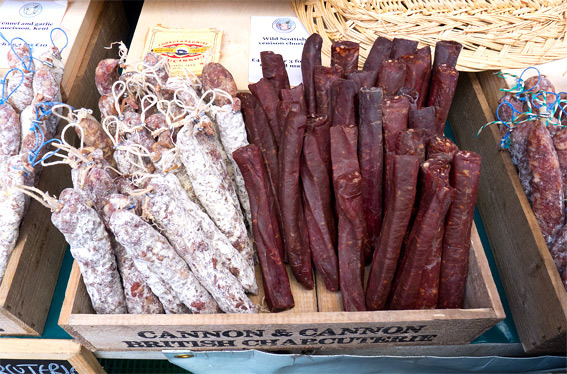 in particular their Scottish venison chorizo, which was so good it could have come from Spain. I particularly enjoy the fact that you can try the cheese and cured meats before you buy. 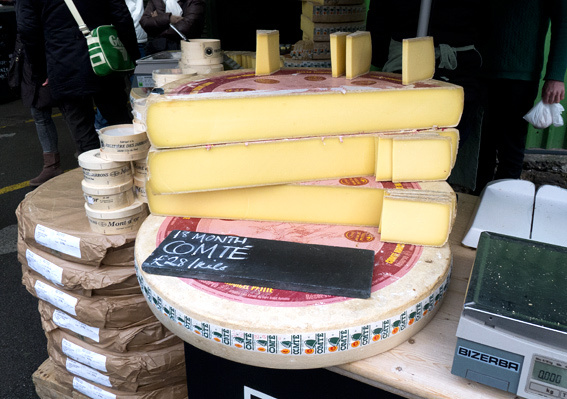 There were at least three stalls selling Comté cheese. My favourite being the Comté sold by the Borough Cheese Company. 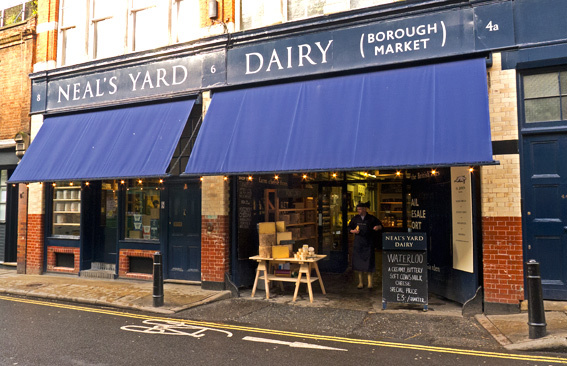 As an additional bonus, Borough Market is surrounded by shops, bars and restaurants, such as Brindisa, Monmouth Coffee Company, Neal’s Yard Dairy, The Globe, The Wright Brothers, etc. I hadn’t visited for a while until recently, but it has struck me that Borough is every bit as good as the Boqueria in Barcelona and other old school European markets. This entry was posted in Barcelona, Drink, Eating Out, Fish, Food, Game, Meat, Restaurants, Shopping, Spanish and tagged Borough Cheese Company, Borough Market, Bread Ahead Bakery, Cannon and Cannon, charcuterie, Comté, Furness Fish Poultry and Game, La Boqueria, Neal's Yard Dairy, Wyndham House Poultry. Bookmark the permalink. What a cool place to visit! I would have an incredibly difficult time leaving empty handed! My son is planning a two week visit to London late summer before school starts in the fall. I will be sure to share this post with him. Have a great weekend! Woud be lovely to be there and shop in the market. Thanks for the wonderful tour. She has been taking it easy lately. I love the adventures you created for her. Have to see what she’s been up to and post. Work sure gets in the way sometimes. Haven’t been in a while, but would love to go again, might end up spending a fortune though. Thanks for reminding me of this lovely place. I would be lugging a lot of bags home from the market…it is great. Thank you so much for the fantastic pictorial series. Conor Bofin brought this Market to my attention a few weeks back when we were talking about availability of kangaroo meat. Now I have a much better idea of what is available 🙂 ! You are very lucky MD. Such a selection of fantastic fresh ingredients. Great post, love all the photos and details. 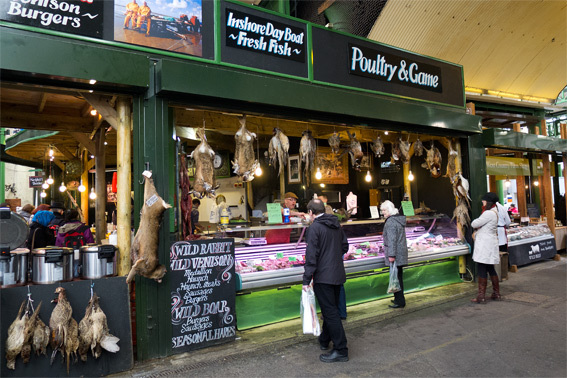 What an amazing market, such a range of products, especially all those hard-to-find British goodies like Cornish squid and Scottish venison chorizo! I love the idea that you can find so much in one place. 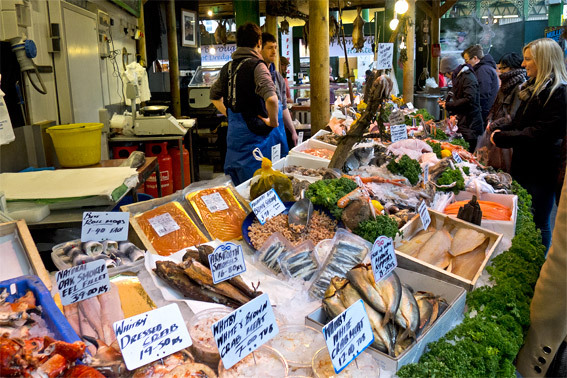 It must be the best, if not the biggest, gourmet market in the UK, no? Haven’t been for over 10 years. Definitely on the list for next visit! Love it. I’m a massive advocate of local markets and British produce. Time we started shouting about it a bit more! Thanks for posting. Wow! I’d visit London just to see that market, MD. And then get caught upon landing at O’Hare, trying to smuggle some venison into the country. I’ll come with you and distract them while you make a run for it!! Oh, Celi! With my leg, the last thing you would want is for me to make a run for it. It’s so not pretty. We might as well just hand the contraband over to Customs and be done with it. We need a better plan. Whilst I love this idea of international venison smuggling, surely you can buy venison mail order in America…? Have you seen this fellows blog yet. he said that he made scotch apples today. Yes, it’s behind the theatres on the South Bank. 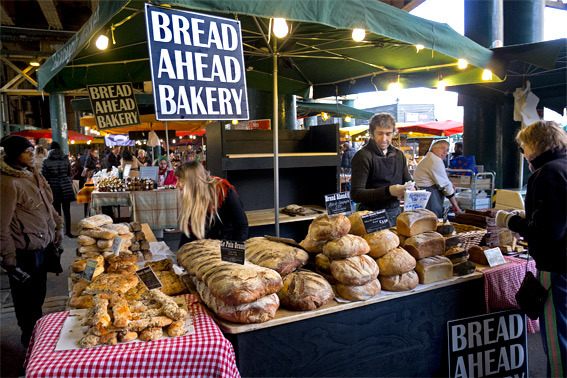 I’ve noticed that a lot of Borough Market traders, especially those selling cooked food, move there at 5 pm on Fridays and Saturdays to sell to the theatregoers. It’s better food and value than a lot of the South Bank chain restaurants. It’s quite fantastic to be able to buy some good spicy food and mulled cider on a cold winter evening. Ah… so you are Mad Dog – was following you anyway! Cecilia has just introduced us. I might be there one day next weekend, but I really need to be concentrating on making the scotch eggs and other stuff , plus the new project – a kind of pop up restaurant on the farm. it may be Steve who owns the farm and a helper next weekend. But my scotch eggs’ll be there. Hi Linda, I think I’d better visit the stall with my friend Fiona, who loves Scotch eggs – hopefully you’ll be there. It is amazing isn’t it – expensive but lovely. And I know of Brindisa because one of the sales guys from the company knocked my dad (who was thankfully only rather bruised, but lucky for a nearly 80 year old) off his vespa about a year ago 😦 Not on purpose, I hasten to add! 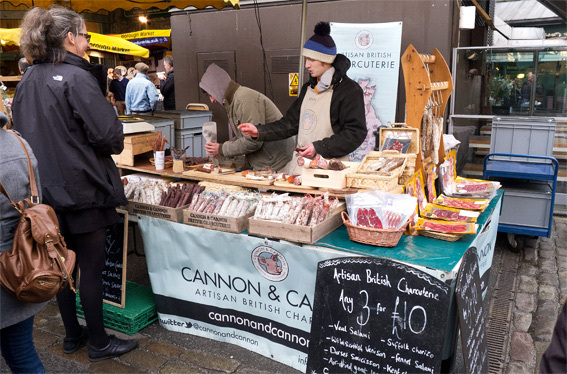 You must try the venison chorizo from Cannon and Cannon – it was amazing! Would have to make sure I got to the post before the dogs!